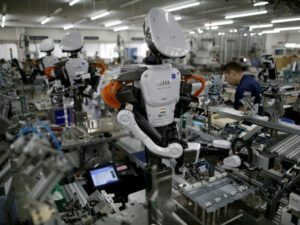 Desperate to overcome Japan’s growing shortage of labor, mid-sized companies are planning to buy robots and other equipment to automate a wide range of tasks, including manufacturing, earthmoving and hotel room service. b. Less human workers mean less tax revenue. Should robots be taxed? 3. The Hen na Hotel, or the “Odd Hotel,” near Tokyo Disneyland, bills itself as a robot hotel because it uses 140 different robots and artificial intelligence to serve guests in its 100-room hotel and can operate with as few as two to three people, according to the manager Yukio Nagai. Would you like to try this hotel?